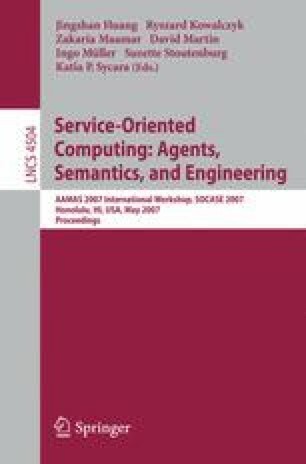 This paper contributes to a line of research that aims to apply agent-oriented techniques in the field of service-oriented computing. In particular, we propose to use goal-oriented techniques from the field of cognitive agent programming for service orchestration. The advantage of using an explicit representation of goals in programming languages is the flexibility in handling failure that goals provide. Moreover, goals have a close correspondence with declarative descriptions as used in the context of semantic web services. This paper now presents first steps towards the definition of a goal-based orchestration language that makes use of semantic matchmaking. The orchestration language we propose and its semantics are formally defined and analyzed, using operational semantics. This work has been sponsored by the project SENSORIA, IST-2005-016004.